It’s been a while since there’s been an update on the progress of the Metrolink Trafford Park Line (TPL). There’s been nothing new published since a number of planning applications appeared on Trafford Council’s planning site back in January. Though preparatory works have been continuing along the route. Through raising concerns on the future of Trafford Wharf with the leader of Trafford Council, Sean Anstee, I’ve been contacted by Transport for Greater Manchester (TfGM) with more details. I can confirm that the existing grassed play area, which is not shown on these images, will be maintained, however, there will be a slight reduction in the grassed area as the tram moves off the waterfront across the recently demolished Communisis building. In addition to the potential loss of Trafford Wharf, I have more general concerns about how the TPL will affect cycling along the whole of the route. The TPL will impact a number of established cycle routes from where it starts at Pomona to the Trafford Centre. Given the negative impact some of the more recent Metrolink extensions have had to cycling in Greater Manchester and the lack of engagement TfGM have had with the cycling community, I think this is a genuine concern. I hope we see some real engagement from TfGM with Greater Manchester cycling groups and the Trafford Cycle Forum on this. I also hope this will be up for review with the new cycling and walking commissioner, Chris Boardman. This image shows the combination of the Trafford Wharf Road / Wharf End, the tramway and the waterfront path. While this image does not show the level differences it does show that we are constructing an open network that doesn’t preclude the movement of pedestrians around the waterfront area. The area shown in orange indicates the existing walkway being opened up through the removal of some of the existing walls in favour of low level retaining walls, a number of trees will also be retained. This image shows a 3D view of the Wharfside area. Due to the removal of Sam Platts Public House and some of the existing walls, we have been able to slightly increase the width of the waterfront walkway to include step-free access onto the lower section of the walkway. The area will also be more open, improving visibility, helping people to feel safer and encouraging more visitors to Wharfside. The corralling will be provided to enable the efficient management of tram users during event days at Old Trafford Stadium. As part of our works, we will be demolishing the existing low level grey business units, the area of which is shown in dark grey. The tramway traverses the edge of this site, i.e. the tramway is not constructed on the waterfront at this point. The trees and green wedge shown are existing features, which are to be retained. Our works do not affect the light grey area, which is the current waterfront walkway, therefore, the walkway area will not be reduced in width. This image shows the point where the tramway does move into the existing waterfront area, however, it traverses along the southern section only. 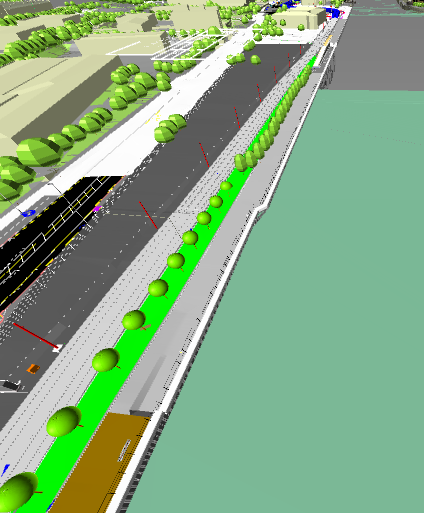 The existing ramp is increased in length and width, this is to permit the tramway to remain at one level as well as maintain pedestrian access in this area. The section of the image in light grey and blue will not be affected. Next Post We are 100!